François Beiger was born December 16, 1945, in the beautiful old town of Strasbourg, in eastern France. "I am tempted to say I was born outside in a caldron full of snow that someone left in the wind." Snow, wind and cold were to be the elements that shaped François' childhood. "At 6 years of age, I got up in the night to watch snowflakes fall. They shined like diamonds in the lights illuminating Strasbourg's Cathedral. I liked to drag my boots in the thick white carpet which covered the street in the space of a night. I was 8, when I discovered the Inuit people and their sled dogs. I had attended a conference by Paul-Émile Victor, who later became my mentor." François was enthusiastic. There was a place on earth where people live in the snow, the cold and the wind. It was a turning point. School was a boring episode except when the subject was the Arctic. Adventure called to the 16-year-old boy. But before the adventure, he had to earn a living. He passions were his wife and fashion. He becomed a clothes designer and created ski clothing, outdoor and mountaineering clothing, but also avant-garde off the rack clothing. An event in 1973 changed his life. In December, he held his newborn baby. "Xavier was born with Down's Syndrome. It did not change the world, but it changed me. Especially at 28 years of age. Life didn't taste the same anymore. It no longer had the same sense. People didn't look at me in the same way. Their comments made me feel like a wounded animal." Two years later, François left France to settle in Switzerland and live in the Alps. He was still fascinated by Paul- Émile Victor and Frison-Roche - the great mountaineer and a writer; and all that concerned the Arctic, the Inuit and the Inuit sled dogs. But his first dogs were Siberian Huskies. Inuit sled dogs were simply not available. Slowly, an idea germinated that one day he would help people with mental disabilities through his Arctic passion. "During the early relationship I had with Xavier and my dogs, I discovered that the dogs were conscious of the handicap of a person. The child with Down's Syndrome finds a balance with the animals. 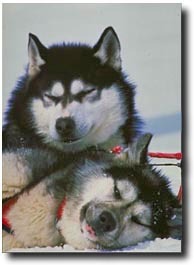 Although I taught Xavier cross-country skiing, our best times were our long and beautiful excursions by dogsled. The walls of my humble farm, on the slope of the Valais, are covered with maps from Alaska and Canada. My dreams were more and more often set on these wide open spaces. But when and how?" In 1991, the 'call of the wild' was stronger than ever. With the support of his wife, his son and a friend, he loaded his eleven Siberian Huskies on a plane bound for Montreal, Canada. He took along a sled, three bags and $920. "I didn't know the Quebecois. I didn't know anybody there. But adventure was beckoning me." In December, François arrived in Clova, somewhere north of Montreal. It is not on the map. He survived this first winter and wrote a book about it: "Onze chiens, un homme, une passion" (Eleven Dogs, One Man and His Dream). He ventured north to Nunavik (Northern Quebec) and came to know Inuit people. "For the first three years I lived with Atikamekw First Nations people," François recounted. "I learned about the traps the North sets for travelers. But little by little, I tamed the cold, the blowing snow which stings the face, the blizzards which shrink the skin... " But what was this price for realizing his childhood dream? This beautiful natural world, the genuine people, the dogs could not replace his family. However, he sensed that something was about to happen. And after a long trip on Hudson's Bay, the idea of sledding all the way round Nunavik was born. Also born at that time was the idea to create a foundation for children with Down's Syndrome. François' mission became crystal clear. He would launch an awareness campaign. "Mentally handicapped persons must have the possibility to blossom, to accomplish something with their lives. They don't have to live in shame and secret." François set a date for his expedition, 1999. He contacted the Perce-Neige Association for mentally challenged people, founded in France by actor Lino Ventura. The Association agreed to sponsor his expedition. "But the hardest task remains. I have to raise funds," François reflects. But he is stubborn. He believes in his mission. He keeps knocking on doors. "Today, I can thank those who believed in me and have supported me in this venture." "I will send reports regularly via Internet throughout the three months of the 2,400 kilometer (1500 mile) expedition I have named 'Perce- Neige Nunavik 99'."